Want to know where to find the next great wine country? For a large chunk of the American population, it's right under your nose. A quick hour and a half from the San Diego airport, Baja California's Guadalupe Valley offers miles of unspoiled scenery, a dry, sunny climate and limited-release wines that are coveted by oenophiles across Latin America, not to mention an up-and-coming selection of aged cheeses and olive oils bright and raw and peppery enough that you'll brave smuggling large quantities back over the border. Visually calling to mind Central California's equally dry and sunny Santa Ynez Valley before the movie "Sideways," the Guadalupe Valley can be a bit deceptive there may be a lot of dirt roads to traverse and a strikingly sleepy vibe, but tucked away within the valley are some of Latin America's most terrific restaurants, most notably the farm-to-table Laja, where weekending Mexico City foodies mingle with the ladies who lunch, down for the day from La Jolla, and the impressive Corazon di Tierra, perched above the vineyards in a rustic-modern glass box and serving up very modern multi-course tasting menus and practicing, as at Laja before it, the art of hyper-local sourcing. 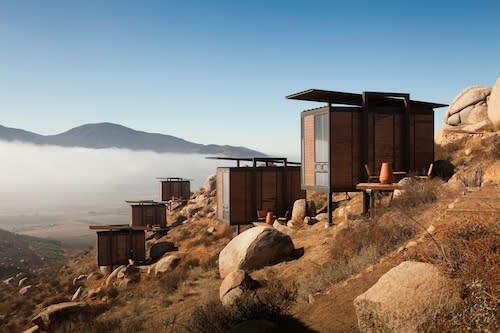 The clincher, though, is the valley's striking new Hotel Endemico, featuring 20 environmentally-sensitive modular mini-suites, scattered across a rocky hillside and featuring beautiful valley views. This is one of the newest projects from Mexico's now-legendary Grupo Habita, which brought Mexico City its first true design hotel more than a decade ago now. Designed by the Tijuana and San Diego-based Gracia Studio, the hotel's daring architecture calls to mind something you'd find in Spain, or Chile, or Argentina's wine country, than anything in Southern California or, for that matter, Mexico. Dcor is minimal, but the perfect kind of minimal, refusing to distract from the surrounding landscape, which you can admire from a private patio, complete with blazing chiminea. How to go: The valley is reached most easily (or, rather, most pleasantly) via the low-key border crossing at Tecate, barely an hour from the San Diego airport. If you prefer not to go it alone, tours are available through Club Tengo Hambre, led by a group of influential bloggers from both sides of the border (). For a more casual affair, link up with the excellent Turista Libre founder Derrik Chinn, an American living in Tijuana, runs periodic trips down to the valley. Both organizations offer private tours upon request. Rooms at the Hotel Endemico begin at $185. For flights, check out our current fare listings for San Diego (SAN).